Our club is for those who ride and share enthusiasm for BMWs as well as all other makes of motorcycles as we socialize, trade tech tips, and ride throughout New Mexico and the Southwest. Our club takes full advantage of this Land of Enchantment with year-round regularly scheduled day rides, the occasional weekend tours, small special interest group rides on pavement and dirt, a monthly traveling breakfast, weekly “unofficial” Sunday breakfasts, and many other seasonal events. We hope you enjoy your online visit with us; if so, we invite you to Join The Club to enjoy the full benefits of membership which include a 10% discount at Sandia and Santa Fe BMW for BMW items, a 10% discount for parts and labor at OCD Custom Cycles & Repair in Santa Fe, free food and fun at our annual winter progressive breakfast, club birthday picnic and club Christmas Party, numerous organized rides and (of course) the camaraderie of fellow riders. We have about 200 members, mostly in New Mexico (mainly in Albuquerque and Santa Fe), with others scattered throughout the Southwest and other states. We also have our great monthly newsletter, The Legendary Shaft; a very active and informative online Message Board where we announce rides, talk about restaurants and exchange tech information; and an Event Calendar which lists our numerous upcoming events and rides. Last, but not least, our annual Bavarian Mountain Weekend Rally, held the weekend immediately after Labor Day, has become one of the most popular BMW and all brand motorcycle events in the Southwest. LOEBMWR has hosted this September event for more than three decades at the Sipapu Ski Area in the heart of the Sangre de Cristo Mountains, with BEAUTIFUL scenery everywhere you look and GREAT ROADS for every type of rider. After you learn a little about us here, please feel free to contact us with your questions. 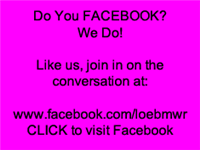 We think you will enjoy your association with the Land of Enchantment BMW Riders.